The following is adapted from a letter sent to students from Mountain Justice. In late March I met with four students from Mountain Justice who presented to me a statement on divestment, and who subsequently shared a petition signed by members of our community urging the College to divest from the fossil fuel industry. I respect the passion with which members of our community seek to make a difference in securing a healthier environment for present and future generations. I believe we all share a deep commitment to finding effective ways to combat the myriad ills that threaten the environment, indeed, the very future of our planet. It is obvious that we agree that sustainability is among the foremost priorities facing our society—and the world—today. Although we may not agree on every specific response proposed to improve sustainable practices, it is my hope that we can acknowledge our common purpose and work together to reach our shared goals. Swarthmore has a long history of expressing its commitment to sustainability and in recent years has actively strengthened this commitment. In 2010, I signed the American College and University Presidents’ Climate Commitment on behalf of Swarthmore, joining other leaders in higher education in accelerating educational and operational efforts to address climate change, including a pledge to develop a Climate Action Plan by January 2013. The plan is very much a work in progress, and we have established a Climate Action Plan Committee comprising students, faculty, and staff in order to support these efforts. This year, we also identified three “green” initiatives that further advance our commitment to responsible environmental stewardship and have vigorously pursued funding to support them, so far securing more than $1.6 million. The first of these initiatives provides additional resources to our academic program, including the creation of a tenure-track position in economics and the environment as well as funds to increase the development of additional courses offered and disciplines represented in our Environmental Studies Program, now explicitly connected to the curricula at both Bryn Mawr and Haverford. The second initiative is a deeper financial commitment to preserve the Crum Woods for use by future generations. We steward our woods carefully, constantly mindful of any disruption to the ecosystems of this natural treasure. Modeled after several successful pilot programs, the third initiative is a more stable funding base for the student-established Renewing Fund for Resource Conservation to help us undertake innovative projects and energy-saving retrofits aimed at moving our campus toward a more environmentally sustainable future. Swarthmore also has a very active and resourceful Sustainability Committee, co-chaired by Professor of Engineering Carr Everbach and Scott Arboretum gardener Nicole Selby ‘02. The committee works tirelessly to advocate for and support concrete actions to reduce greenhouse gas emissions and improve the sustainable operations of the College. For example, in response to a student-led initiative, since 2003 we have purchased renewable energy credits to offset emissions from energy use. Currently renewable energy credits account for 97 percent of our electricity. Along with Swarthmore Borough, we are recognized by the EPA as a Green Power Community and listed as a leader in Green Power Partnership sponsored by the EPA. Since 2005, our greenhouse-gas emissions from heat and electricity have decreased 26 percent, despite increases in both our student population and building square footage. We have also made a commitment to green building—any new construction must build to LEED Silver standard or better. Our campus includes more than 14,000 square feet of green roof, and this summer LPAC will be retrofitted with a green roof. This past year a portion of the 25-acre rolling landscape in front of Parrish Hall has been converted to an organically fertilized lawn. Recycling, management of our storm water runoff, and a commitment, as noted above, to renewable energies such as wind power are other ways in which we manifest our dedication to sustainable practices. Food service is another area where we strive to provide our community with healthy, environmentally responsible food options while reducing waste and energy consumption. Our main food supplier provides us with many local brands, and Dining Services buys directly from a number of local farmers and food producers. Staff members from Dining Services and the Grounds Department have worked closely with the student-led Good Food Project to compost consumer waste generated by food preparation. We divert nearly 75 pounds of food waste per day that would otherwise end up in a landfill. Many of these efforts have been either student initiated or supported, and we seek to both preserve the environment as well as set visible, educative examples of good environmental citizenship. In short, the time and the circumstances are ripe for collaboration rather than divisive and adversarial uses of our combined energies. Together, we have the energy, creativity, and drive to make a difference here and beyond our campus. Students from Mountain Justice asked me to support their request of the Board of Managers that it divest from fossil fuel companies, and to do so in advance of the May meeting of its Committee on Social Responsibility, where the students will have the chance to present their proposal. As I indicated to the students in late March, I do not believe that the Board will act against its established policy, articulated within the endowment guidelines, stating that the Investment Committee should “manage the endowment to yield the best long-term financial results, rather than to pursue social objectives.” The Board is more likely to encourage Mountain Justice to join us in formulating different, more holistic approaches in pursuit of a cleaner, healthier environment. The Investment Committee believes that we should be an active shareholder in the companies whose shares we own, thereby enabling us to hold them accountable. Indeed, we have some notable examples in our history where effecting positive social change has come from exerting influence on a company by virtue of our stockholder presence. Such was the case when, for example, Swarthmore was directly responsible for altering the practices of three Fortune 500 companies to broaden their equal opportunity policies to ban discrimination on the basis of sexual orientation. I believe that the Board’s policy is a responsible one focused as it is on the primary mission of providing an exceptional liberal arts education and generous financial aid policies that support the value we place on access. A strong endowment ensures that we are able to deliver on our mission for both present and future students. I certainly can imagine Swarthmore College, all of us in collaboration, playing a powerful leadership role, addressing the complex issues of sustainability and I am eager to work with all community members towards that end. She, and presumably the Investment Committee, has interpreted this to preclude divestment. I think this is a mistake. In the morality of investment, sins of omission and sins of commission are very different beasts. If President Chopp, and the Investment Committee, disagree that these companies’ conduct has reached a level that can be fairly characterized as morally reprehensible, then they should defend their continued investment on the basis of the guidelines. 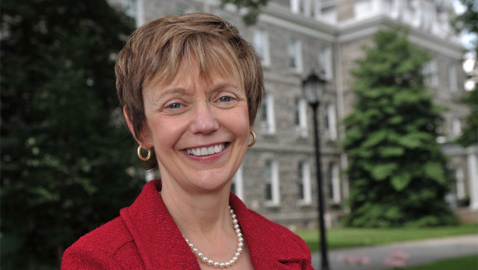 If, however, they agree that these companies are committing social injustice, the guidelines do not preclude Swarthmore from choosing not to finance public harm as it seeks profit for Swarthmore’s endowment in whatever morally ambiguous manner it deems fit. The last two real paragraphs, where RC finally states her position, are fine. I’m not sure that fossil fuel divestment significantly affects the Colleges ability to provide a first class education to students from all walks of life, but the overall policy is sound. That said, I think it’s a little bit disturbing that RC found it necessary to recite the litany of our green initiatives before taking a clear stance on the question at hand. The call for “collaboration” reads more like a dismissive, condescending brush-off to student activism and its efforts to hold the admin. accountable and push the debate. The best collaboration, the kind that uses different perspectives to bridge gaps of understanding and find better solutions, is always adversarial. RC’s rejection the value of challenge and debate in truly collaborative processes, combined with the bulk of her letter being devoted to self-congratulation, is cause for concern and only serves to confirm the need for greater accountability.